Hey kiddoes, remember the King Family? 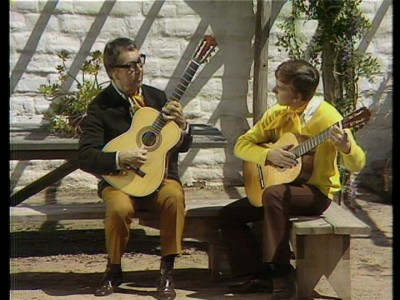 They were the wholesome '60s television staple who lived next door to Andy Williams on Variety Show Lane, down the block from the Dean Martin Cocktail Lounge and a few miles from the Lawrence Welk Retirement Community. The two-DVD set The King Family Classic Television Specials Collection, Volume 1 presents four of the perky brood's variety specials as they were originally aired in 1968-69. While it doesn't include any of the achingly sweet Christmas shows they're known for (perhaps they're being saved for Volume 2? ), these specials celebrating Easter, Mother's Day, summer and back-to-school serve up a bumper crop of the Kings' toothy, proto-Osmonds brand of entertainment. Sunny, uniquely Californian, diabetic coma-inducing entertainment. 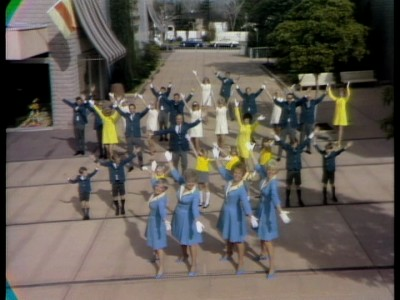 Although these specials have rarely been screened since the final King Family special in 1974, this energetic troupe of singing, dancing aunts, uncles, sisters, cousins and kids were a constant presence on the airwaves during their heyday. For anyone under the age of fifty, you can be forgiven for watching this stuff and wondering "Who the heck are these people and why are they so goddamn happy?" 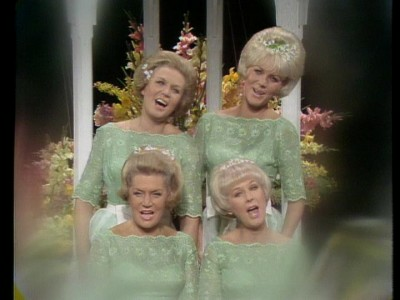 While I can't answer the latter, I can tell you that the King dynasty goes back to The King Sisters, a Utah-raised harmonizing vocal quartet formed in the 1930s. Heavily influenced by The Boswell Sisters, the singing Kings racked up several hits both fronting various Big Bands and on their own. Their first regular television exposure came on a 1951 series hosted by guitarist Alvino Rey, married to King sister Luise since 1937. Rey and the King Sisters then co-headlined their own series in 1953. The idea of bringing in the other King spouses, kids and assorted misc. 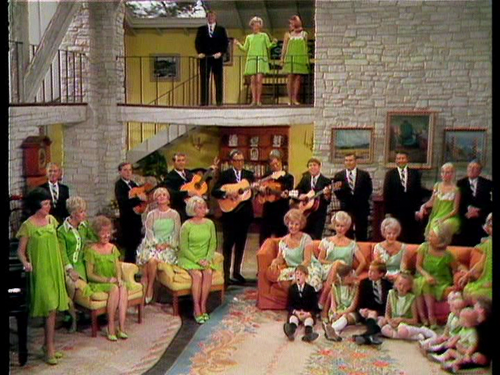 family members began with the 1964 ABC special The Family Is King, the success of which led the group to enjoy their own prime time hour-long series (later trimmed to a half-hour) running weekly in 1965 and early 1966. The breezy, unabashedly dorky specials included on The King Family Classic Television Specials Collection, Volume 1 come from a syndicated package of holiday-themed programs made in 1967-69. With 30 to 35 Kings on screen at any given time, it's hard to keep track of who's who, but the focus on the family (no guest stars) makes it more consistent than other variety shows of the period, while the younger generation of Kings keeps things lively and engaging. Far from the Lawrence Welk-style of singers standing stick-straight on an antiseptic stage, these specials are mostly shot outdoors with the various Kings (even the older folks) energetically performing in goofy, loosely choreographed numbers. 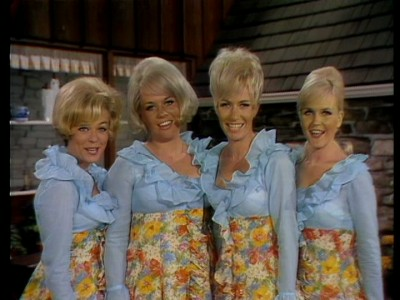 The King Sisters are front-and-center, of course, with bubbly sister Yvonne acting as an informal host. They also devote lots of time to The Four King Cousins, a groovy singing quartet which included actress Tina Cole, then a regular on the sitcom My Three Sons. The cousins' perky renditions of then-current hits like "Happy Together" and "Lazy Day" contrast nicely with the lovely but more traditional repertoire of their moms/aunts. Elsewhere, Alvino Rey's artistry with the acoustic guitar is still amazing to behold, while other segments with bland actor Bob Clarke and snooze-inducing vocalist Kent Larsen don't hold up so well. A phalanx of King urchins are also on hand to bring on the cuteness, although some of them perform in a half-hearted "I'm only doing this for the ice cream I was promised" kinda way. Despite flaws with some of the individual performers, on the whole I found these programs wholesome and charming. A big part of what makes them work is the decision to film in outdoor settings throughout Southern California. A new outdoor shopping center in Sherman Oaks, the verdant Los Angeles County Arboretum in Arcadia (where Tattoo would eventually shout "De plane, de plane!" on Fantasy Island), a Mormon church in Van Nuys, and a school campus in Camarillo provide sunny backdrops which complement the Kings' White Bread optimism. It contributes to the casual, comfy vibe of these shows, which also comes from the fact that many of the King relatives had a hand in the production side as well. While the King Family itself is a relic of '60s TV, many of the individual members are still active. The Four King Cousins have recently reunited and are still performing, while other relatives such as voice actor Cam Clarke (seen as a young kid in these specials) and two of Alvino Rey's grandsons (not yet born when the specials were filmed; currently members of rock group Arcade Fire) carry on the family's performing tradition. The MVD Visual release of The King Family Classic Television Specials Collection, Volume 1 comes as a two-disc set packaged in a standard-width keep case. Each disc is affixed to opposite sides in the package, while the accompanying booklet sits freely inside. Mastered from videotape sources, the specials are riddled with artifacts like horizontal lines, haloed edges and splotchy color. It's a decent looking visual presentation with relatively well-saturated, lovely color and a wobbly picture that's likely similar to how it was originally broadcast. These shows need to be seen on a chunky wood-paneled TV set from the '60s for maximum effect. These all have their original mono soundtracks, which are tinny and subject to distortion at random moments. The music and dialogue are mixed at a pleasant, equal levels. No subtitles are included. Disc One includes some fascinating home movies shot by James Conkling (husband of the King Sisters' Donna) during production of the Mother's Day special on the MGM studio backlot in Culver City. There's also some nice, lengthy excerpts from the family's Valentine's Day special from 1968 (although the master tape for the entire special is lost, these clips were taken from a highlights reel discovered in 2010). Disc Two includes another set of home movies from the September special, along with 15-minutes' worth of King Family Show clips from the June 5, 1965 episode presented as a black and white kinescope. An excellent 8-page booklet contains color photos, a mini-history on the family written by Rene Reyes and Shane Rosamonda, air dates and comprehensive descriptions on all four specials, and a listing of every series and special the busy Kings did throughout the years. As The King Family Classic Television Specials Collection, Volume 1 demonstrates, people back in the '60s loved seeing a small army of frighteningly perky people with varying levels of talent on their television screens. The four vintage specials are as corny as it gets, yet the family's enthusiasm and the fresh outdoor locales make it quite a fun, groovy little trip. Camp appeal aside, these specials were done with a lot of love, and it carries through to this nicely packaged two-disc set. Recommended.